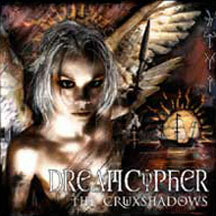 DreamCypher is The Cruxshadows first new full length album since the breakthrough success of Ethernaut in 2003. Featuring their trademark sound of addictive programming, theatrical male vocals, lots of synths, guitar, and violins, coupled with honest and emotional lyrics, its sure to propel them to even greater heights : DreamCypher is a musical blend of Gothic Dance and Future Pop that will satisfy fans of both. The sixth studio album from The Cruxshadows includes the single “Sophia” which reached #1 on the Billboard Dance Singles Sales Chart. One of the most popular Darkwave bands internationally, the Cruxshadows started in the early 1990’s in a little town in North Florida. Over the last 15 years their success among the gothic, ebm, new wave, & dark electronic genres has earned them a near legendary underground status. With a constant and ambitious release schedule, and a dizzying live performance itinerary, they have turned conventional wisdom on it’s ear & maintained their position among the scenes elite from each year to the next. They have played many hundreds of shows worldwide including concerts in Norway, Sweden, Scotland, Ireland, England, Belgium, The Netherlands, Poland, France, Hungary, The Czech Republic, Germany, Austria, Switzerland, Italy, Denmark, Portugal, Greece, Latvia, Lithuania, Luxembourg, Mexico, Canada, Spain, The United States, and many, many more. They were one of the first Western acts to play in Romania & Serbia following the cold war. In recent years they have had several alternative chart toppers in Western Europe and their festival shows have drawn audiences as large as 18,000+ people to a Cruxshadows performance (in front of the stage). In 2005 the Cruxshadows headlined Bochum Total- a German downtown festival, that over 4 days drew an estimated 950,000 people. A blend of new wave, gothic, and electronica, the band’s unique and often catchy songs have become staples of the darkwave, ebm, and electro-alternative scene. The band’s uniqueness transcends the realm of dance or club music. The rich and romantic flavor of the electric violin played by Rachel McDonnell, mixed with crunchy and sometimes biting guitar lines laid down by George Bikos, gives the Cruxshadows a wide berth of musical possibilities. This is juxtaposed with the cold digital world of electronic textures and synthesis associated often with synth-pop and EBM. Add the moody musings of front man, composer, founder, and lead singer Rogue, and you have a guarantee that this band is anything but typical. With over 11 CDs, a DVD, and more compilation appearances than you can count, The Cruxshadows have made themselves synonymous with a new breed of electro-goth music. Their energy and intensity on stage led them to be called “the best live band in Europe today” by the host of Hamburg’s popular Crazy Clip Show and their performances have been aired regularly on German national television. If you have an opportunity to see them live, don’t pass it up. In 2005 The Cruxshadows was voted the #5 best band in the EBM, Darkwave, Gothic, & Industrial scene (all time) in a recent international poll hosted by the Wave Gothic Treffen. ?